When I first saw this cute idea for a healthy Halloween snack, I was a little concerned. I thought the hair was made from black olives. Despite the fact that apples and olives seemed like a weird combo, I was more concerned that I could never get my kids to eat these cute Frankenstein Halloween snacks because despite my best efforts, none of my children will eat olives. This breaks my heart at Thanksgiving when none of them enjoy putting black olives on their fingers, but that is another story! Luckily they are dark grapes, something my kids will totally eat! 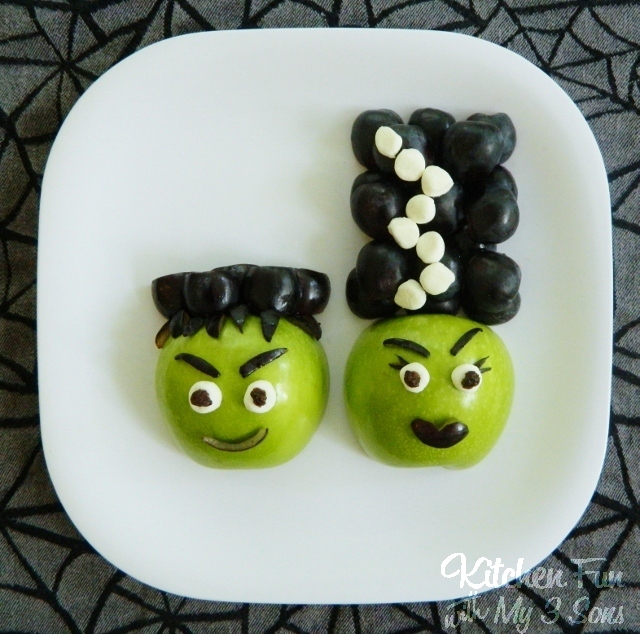 So if you want to make these fun Frankenstein fruit snacks, with olives or with grapes, you can check them out over at Kitchen Fun With My 3 Sons.